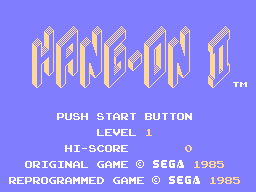 Hang-On II (ハングオンII) is an SG-1000 sequel to the critically acclaimed Hang-On. Despite the name, the game is meant as a direct sequel to the Mark III version of Hang-On, and is virtually identical to that game. The only difference is downgraded graphics and the addition of music from the arcade version. Meanwhile, Super Hang-On is the direct sequel to the arcade game. It is compatible with the BH-400 bike handle controller, and would be the only SG-1000 game designed for it (though the peripheral is compatible with the Sega Master System and Sega Mega Drive).